BEIJING, Jan. 29, 2019 /PRNewswire/ -- After undertaking an in-depth study of China, Jim Rogers, an international investor who started his career in the financial industry in 1980 and has become one of the world's most renowned investors, said that China is the only country in the world that has experienced multiple periods of prosperity and that "the 21st century belongs to the country". Over the past several years, he has made major investments in a number of Chinese sectors, among them, agriculture, healthcare and environmental protection. 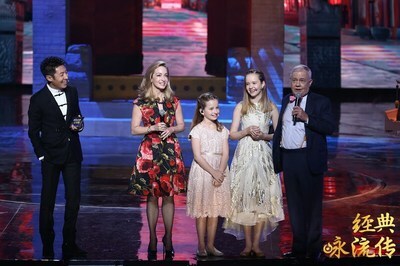 On January 28, 2019, Rogers, together with his two daughters Happy and Bee, were guest stars on an episode of the second season of CCTV's Everlasting Classics. Everlasting Classics is a popular Chinese-language poetry and music show regularly broadcast on CCTV-1, the primary channel of China Central Television (CCTV). During the show, Happy and Bee sang a Chinese song based on an excerpt from ABC of Sound Meters in Chinese Poetry, a compilation of reading material to train children to master rules and forms of classical poetic composition and phonology written during the Qing Dynasty. After completing the performance, they shared their experience in learning Chinese. Each episode, broken into two sessions - poetry-based music performances by participants followed by reviews by guest judges - is designed to communicate the concepts and significance of classical Chinese poetry by combining it with music. After the performance by his daughters, Rogers said on stage that he had made what he considered the most important investment in the education of his daughters: encouraging them from a young age to learn Chinese. The modern investment legend on Wall Street stated that in just over 30 years since he first came to China in 1984, the country has experienced the most impressive period of economic growth and that learning Chinese is the key to opening the door to the future. His appearance on the regularly scheduled Chinese-language culture program on the Chinese nation's most authoritative TV channel is a testament to Rogers' recognition of the significance of Chinese culture and the importance of the country's economic growth. The episode featuring Rogers' daughters started receiving positive feedback from Chinese audiences as soon as the closing credits started rolling. Both Happy's and Bee's proficiency in Chinese and Rogers' talk about China during the show impressed viewers who are equally optimistic about the China's future role on the international stage. In addition, Rogers' retelling of the story about how he handled the education of his daughters during the show has spurred discussions among Chinese audiences and served as a testament to the powerful impact of Chinese culture on international markets. This is the essential reason why an increasing number of foreigners want to know about China and learn Chinese, and even to work, live and invest in the country.